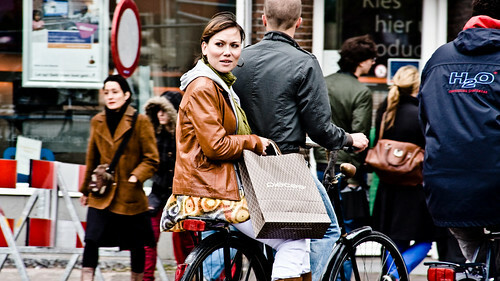 There are many similarities between Amsterdam and Copenhagen regarding our bicycle cultures. Many. There are, however, some interesting differences. 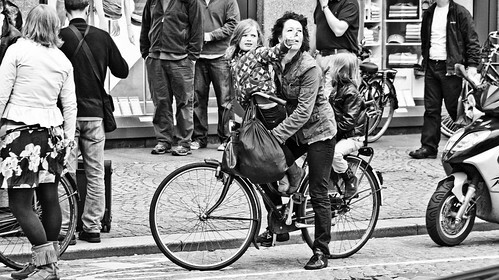 In Denmark you're not 'allowed' to ride with two on a bike unless the bike is 'fitted to accomodate a passenger'. Which means a child's seat. However, to get around this strange law you can, for example, just tie a piece of rope around the person on the back rack. In Amsterdam this doubling on bikes is second nature. Everyone does it, day and night, and most do it side-saddle. The great thing is that none of the passengers hold on. They just sit there calmly with their hands in their lap, looking around at the city. Brilliant. 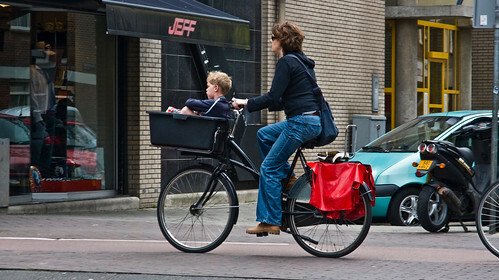 Even the kids just hang out on the back rack while their Supermum pedals off. Tripling is popular, too. One kid on the back and the other one balancing on the frame. Or hanging out in the bucket on the front. Another difference between the two cities is the Chic-o-meter. Here Copenhagen has Amsterdam beat. The fashion bar is raised much higher in Copenhagen, even though there are cool, fashionable people in Amsterdam. From a traffic perspective, Copenhagen resembles many other cities in it's layout, which is why so many planners come here to envision how their city would look with a sea of bicycles. Amsterdam is so unique in it's layout that it's hard to envision anything but wonderful, beautiful Amsterdam. With all that said, Copenhagen has a firm grip on my heart but I'll flirt sexily with Amsterdam forever. By the time you read this, I'll be in the air somewhere over Siberia, on my way to Cycle Chic in Japan. Stay tuned. I find it truly beautiful sharing a bike walk. Surely we shouldn't have such double standards in the EU? If we're a united Europe then all the laws should be the same - and allow bike sharing. This is the health and safety nuts getting their way again.